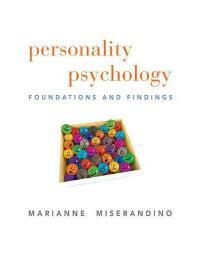 Personality Psychology 1 Edition H elps students relate current research in the field of personality psychology to their daily lives. This book introduces students to the basic foundations and latest findings by presenting the fundamental questions, accumulated knowledge, and latest findings in genetics, neuroscience, traits, self and identity, intrapsychic aspects, regulation, motivation, and cognition, as well as the integration across these areas. Personality Psychology is an undergraduate textbook for personality psychology: the study of individual differences, for identifying ways in which people are both similar and different and for explaining how they became that way. Written with an approachable, story-telling style, the author presents an evidence-based text with integrated culture references and the key building blocks of the subject matter: genetics, neuroscience, and cognition. Miserandino is an APA-award winning teacher and has placed learning tools such as self-assessments within each chapter that guide students into a complete understanding throughout the text. Click here to view a sample chapter! http://bit.ly/Miserandino Learning Goals Upon completing this book, readers should be able to: Analyze both the foundations and findings of the research process Learn about themselves, the people around them, and how personality psychology applies to their everyday lives Understand and interpret new discoveries in psychology and related fields as they occur in the future Note: MySearchLab does not come automatically packaged with this text. To purchase MySearchLab, please visit: www.mysearchlab.com or you can purchase a valuepack of the text + MySearchLab (at no additional cost).